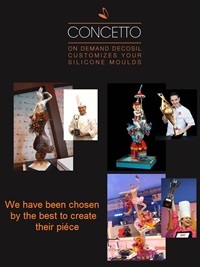 Decosil produces Silicone chocolate molds. Manufacturer of shaped silicone chocolate molds. Chocolate silicone molds Made in Italy. 3D chocolate Molds. Are you searching for Silicone Chocolate molds and shaped silicone molds? decosil is a manufacturer of food grade Silicone Molds, 100% Made in Italy. Manufacturer of Chocolate Silicone Molds suitable for pastry and useful to make sculptures, decorations and monumental cakes, wedding cakes. Decosil produces 3D chocolate Molds and shaped molds for chocolate, shaped silicone molds for chocolate. Decosil silicone molds are destined to last for a long time. Easter chocolate molds and Easter egg chocolate molds in 3D. Chocolate Egg Molds and Chocolate Easter molds made in Italy. Silicone molds cake decorations for Christening cakes and Christening cakes decorations. Silicone 3D chocolate molds for wedding cake toppers and figurines molds. Silicone chocolate moulds Made in Italy. Animal silicone molds. Animal cake toppers for cake design. decosil 3d animal silicone molds. Cute 3d chocolate animal molds made in Italy. Flowers silicone molds for cake decorating. Silicone molds leaves for sugar and chocolate. Silicone Molds for chocolate lollipops. Wedding lollipop molds, custom lollipop molds. Chocolate lollipop molds wholasale in Italy.